When it comes to New York, it’s more than just the Big Apple. Travel about an hour north of Manhattan and you’ll be in the Hudson Valley—rich with historical sites, wineries, national parks, rail-trails and more. Where exactly is the Hudson Valley? I can almost guarantee you that every person you ask will give you a different answer. Actually, it is a 10-county region that stretches from Albany County down through Westchester County. The “Upper Hudson” portion includes Albany, Columbia, Greene and Rensselaer counties while the “Lower Hudson” contains Putnam, Rockland and all of Westchester. 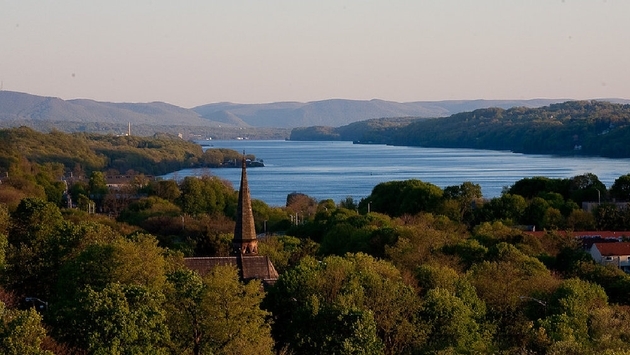 “There is no shortage of day or weekend trip options in upstate New York, from the natural beauty of state parks to the amazing history of the region,” says Chris Caulfield, CruiseOne Franchise Owner and Vacation Specialist in Croton on Hudson in Westchester County. There isn’t a bad time to visit the Hudson Valley, but autumn is the well-known highlight. “People come to see the change of leaf colors,” says Marianne DeIulio, Independent Travel Consultant of Just Travelin’ in Mohegan Lake, New York. One of the best places to get a great view of the valley’s Hudson River is on the Walkway Over the Hudson State Historic Park—the world's longest elevated pedestrian walkway, which connects Dutchess and Ulster counties. You can also get a great view at the top of Mohonk Mountain House in New Paltz. Speaking of hikes, Mohonk Mountain House launched six new hikes for their 85 miles of trails, including a survivalist hike and a Forest Bathing excursion where hikers will explore Mohonk’s cliffs, crystal-clear lake and wooded trails. “This could be a trip all its own,” says Caulfield. When you’re done with your hikes and have built up a thirst, the Hudson Valley is also home to some of the best wineries on the east coast. Caulfield says that one of his favorite weekend trips is visiting Millbrook Winery in Millbrook. There is also the Shawangunk Wine Trail, home to 15 wineries nestled between the Shawangunk Mountains and the Hudson River: “There are dozens of wineries that are along different trails you can explore." Karen Quinn-Panzer recommends travelers check out the lower Hudson Valley: “My top two tips for a weekend in the Hudson Valley Area are a weekend in Cold Spring and a weekend in Tarrytown,” says the Dream Vacations Franchise Owner and Vacation Specialist with Quinn Panzer Travel in Milford, Connecticut. If you’re feeling a little historic, make sure you visit Hyde Park’s Vanderbilt Mansion or the Mills State Park/Staatsburgh State Historic Site. There’s something for everyone.